*** AT OUR SEVIERVILLE LOCATION ***The 2009 Honda Civic gets a freshened look. The Civic continues holds its position at the top of the highly competitive compact class, thanks to innovative styling, refinement, Honda reliability, and a broad model line that ranges from the eco-friendly Civic Hybrid to the racy Civic Si. 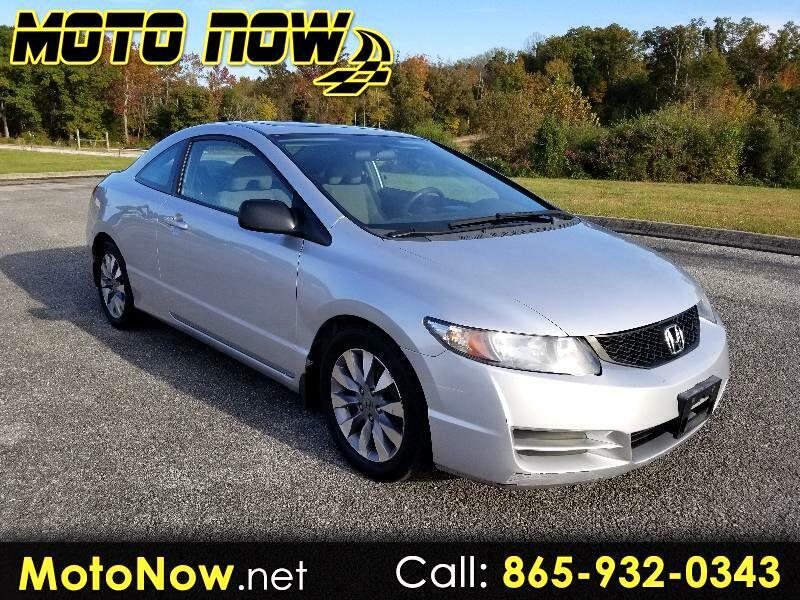 All 2009 Civics present a fresh face to the world, with a new bumper and grille up front, and new headlight and taillight color combinations. Uplevel models feature new alloy wheel designs as well. Inside, all 2009 Civic models come with a sporty three-spoke steering wheel. Interior fabrics have been upgraded and the 2009 Civic Hybrid model is available with leather. New technology includes Bluetooth HandsFreeLink on Navigation-equipped models, and a USB audio interface on Civic EX, EX-L, Hybrid, and Si. We've found the Civic comfortable and affords the driver outstanding outward visibility. The Civic comes standard with side-impact airbags and other safety features that are optional on competitive models. Vehicle Stability Assist, which is Honda's name for electronic stability control, is now standard on the Civic EX-L and Civic Hybrid, in addition to the Civic Si. The sporty Civic Si coupe and sedan share a 197-horsepower engine, six-speed manual transmission, four-wheel-disc brakes, and supportive sport seats. The Honda Civic Hybrid sedan is powered by a 1.3-liter four-cylinder engine coupled with a permanent magnet electric motor and a continuously variable transmission. The Hybrid features dramatically reduced emissions, and it delivers an EPA-rated 40/45 mpg City/Highway, second only to the 48/45 mpg of the Toyota Prius. The Civic GX sedan uses natural gas for fuel. Natural gas is available to residents of California and New York and is used by fleets elsewhere. The Honda Civic comes in coupe and sedan versions. Civic DX, LX, and EX models share a 140-hp, 1.8-liter four-cylinder engine with a standard five-speed manual transmission. A five-speed automatic ($800) is optional. Two new trim levels, the DX-VP and LX-S, have been added for 2009. Civic DX coupe ($15,305) and sedan ($15,505) are the base models. Standard equipment is confined to power windows, tilt-and-telescope steering wheel, height-adjustable driver's seat and fold-down rear seatback. The coupe gets a rear decklid spoiler. Buyers wanting a radio must supply their own or order from the dealer, but a rear window-integrated radio antenna is standard. Brakes are disc in front, drum in rear. P195/65R15 tires wrap around steel wheels with full-cover hubcaps. Civic DX-VP sedan ($16,255) adds air conditioning, plus a four-speaker, 160-watt AM/FM/CD/MP3 audio system with an auxiliary input jack, CD text display, and speed-sensitive volume control. Civic LX coupe ($17,255) and sedan ($17,455) add cruise control with steering-wheel-mounted controls; power door locks with keyless entry; center console with sliding armrest; overhead map lights; express up/down for the driver's power window; and P205/55R16 tires on steel wheels with covers. The sedan comes with a four-speaker stereo (same as DX-VP), but the coupe has a six-speaker system, and also a rear-seat walk-in feature that remembers the front passenger seat's setting. Civic LX-S sedan ($18,055) upgrades to alloy wheels, exclusive sport-trimmed black cloth seats with synthetic suede bolsters and silver stitching, a leather-wrapped steering wheel, a rear deck spoiler, and a chrome exhaust finisher. Civic EX coupe and sedan ($19,305) add a power moonroof; variable-speed intermittent windshield wipers; a second 12-volt power outlet; a 60/40 split folding rear seatback; and outside temperature indicator. The steering wheel reverts to plastic, but adds audio controls; while the keyless remote adds a trunk release button. Brakes upgrade to four-wheel discs. The sedan's stereo adds two speakers (for a total of six); while the coupe gets a 350-watt, seven-speaker system; both get a USB interface. EX coupe is available with manual transmission, XM Satellite Radio, and voice-recognition Navigation ($21,305).